Potatoes are relatively easy to grow in the home garden. Preparing the soil for your crop of potatoes takes little effort and virtually no maintenance. A soil test can guide you in making sure your soil has the right pH and nutrient levels for potato growth. Following a few basic steps for preparing the soil can provide you with plenty of potatoes for both spring and fall plantings. Potatoes are adaptable to many soil types but the ideal soil type is a well-drained sandy loam. Soils with a sandy composition tend to dry out and warm up earlier in the spring making it possible to plant seed potatoes earlier. Other soil types will work as long as they are well-drained. Poorly drained soils like clay tend to cause deformed potatoes or potato rot. More important than the type of soil is the pH of the soil. A soil that is too alkaline can cause scab disease, the brown corky patches that develop on the surface of the potatoes. One way to combat this is to plant scab-resistant seed potatoes. Another way is to lower the pH by adding a soil amendment such as sulphur. This should be done following a soil test and based on the test recommendations for the amount and rate to apply. Potatoes need loose soil to spread out and grow in. Tightly compacted soil such as clay makes it difficult for tubers to grow and expand. A deep bed is not necessary. Till or work the soil with a shovel to a depth of about 6 inches to break up any clumps. Work in organic matter such as compost or peat moss. Once the soil has reached the proper depth and consistency, dig a shallow trench about 3 1/2 to 4 1/2 inches deep to place the seed potatoes in. Cover the seeds with a couple of inches of soil. Seed pieces should be 12 to 18 inches apart. Each time the potatoes add 6 inches of growth, more soil should be mounded around the base of the plant so that by the time the plant is 18 inches tall, the mound is 4 to 5 inches high. 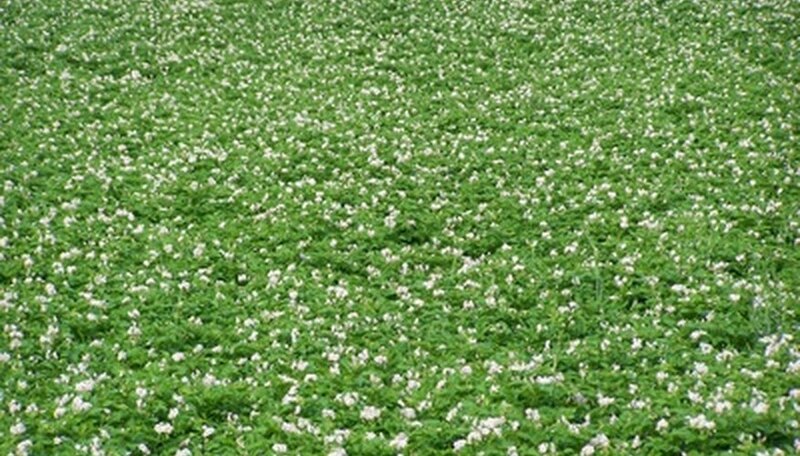 Potatoes do benefit from adding fertilizer to the soil. However, caution should be used to avoid over-fertilization. Again, following the recommendations of a soil test is the best route but for general purposes, a fertilizer blend of 8-10-10 or 16-20-20 is practical for potatoes. Spread at a rate of 2 1/2 to 3 pounds per 100 square feet. This should be worked into the soil prior to planting. A second application when the plants are 4 to 6 inches tall should be banded along either side of the row, about 6 to 10 inches from the plant so as not to burn the plants. During the last few weeks of growth, a 4- to 6-inch layer of straw keeps soil moister and cooler, which produces larger potatoes. Some gardeners prefer straw to soil for potato beds altogether. In this instance, seed potatoes are spaced in the same manner but laid on top of the soil. A 4- to 6-inch layer of straw is placed over them and between the rows. Sprouts emerge and more straw is added throughout the growing season. Harvest is easily accomplished by simply removing the straw and picking up the potatoes. In addition to keeping the soil cooler and holding in moisture, the straw acts as a weed barrier and allows larger, better-shaped tubers.